What a night in the Big Brother 2014 house, as we had some big time emotions come out during the live eviction show last night and then we finally got an endurance competition on the Live Feeds! After that competition, I don’t think we are going to see much action today and a lot of people not able to get out of bed and move! Either way, we have a new HoH on Big Brother 16 and nominees were discussed. Check out the highlights from Thursday below in our Big Brother 2014 spoilers! After saying goodbye to Donny, the HGs got started on the new HoH competition and it lasted over two hours and they took a beating. 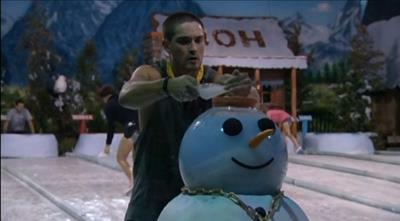 The live feeds refused to show us Caleb’s snowman, which meant he was in the lead. We saw a lot of Victoria, who was in last place, which is exactly what I wanted to see! In the end, Caleb won HoH and where this goes is beyond me. No big shocker, but Frankie went running to Caleb to “celebrate” afterwards, even with Caleb passed out on the ground after killing himself for that victory. I will give it to Caleb on this one: Beast Mode Cowboy came out for this win. And I’ll give props to Christine, who did one more scoop after Caleb grabbed his coal and she was able to grab her coal. This type of event has always been won by a man, so Christine almost broke that winning streak. Like her or not, that is impressive. Now I will discuss the night in thoughts, because I can. FRANKIE: I do not like him. Loved his face when Julie Chen denied him apple pie. He was hurt by this and talked about it more and more as the night went on. He heard the screams for Donny and thinks there is something more to Donny, which is why America loved him. He thinks Big Brother fans don’t care who his sister is (duh). He thought his sister should have promoted her new album in his video message from her. He thinks he is hated by America because he is a huge star (who heard of him prior to this show)? He thinks America rejected the Team America mission because we are not ready to see a man in drag (or we wanted to see a mission being accomplished and not a normal night on the feeds for you)? NOMINEES: There was talk of the nominees and it looks like Caleb will be putting up Christine and Nicole today. They have thoughts that the girls could be working together, especially since Nicole was giving advice to Christine during the HoH competition. Because of that, they want them both on the block and Christine can’t win veto and take Nicole down. This could play out to be a very interesting week, especially if Nicole wins veto and they go after each other. Then Nicole wins HoH during the Double Eviction on Thursday and we have a big mess! Also, there is no guarantee that Nicole is the main target for the week, as none of the guys fully trust Christine. CODY: I just need to vent about him, as he is annoying more and more every day in that Big Brother 2014 house. He promised an “epic” nomination speech last week and was going to go off on Donny, which he said he loved him. He has said many times he was going to go off on someone and it never happens. He was saying how he hates Frankie last night and he should have put him up, but that takes balls and we all know Cody had his chopped off before he moved in. He tells Caleb to go off on Nicole during his nomination speech, so Caleb should tell her how much he loves her then? Great observations Todd. Fully agree with you. Frankie was even more disgusting than usual last night as he finally realizes America is not in love with him. What an egotistical SOB. He blames everyone but himself. Well I never heard of him or his sister. It also seems like half the house did not either. Now for his sister who is a star for the young crowd probably mostly for people under 20, I don’t see how he is a big star. He is on Youtube. Whoooo Hoooo!!! I heard of his sister and like her music, but she has annoyed me more and more this summer too lol. I know people make money doing that. It’s just that ever time he mentions it, he makes himself more and more famous. First he was on Youtube then he was a mogual and now he is a HUGE star. Ever notice how the person he seems to love the most when giving shout-outs is Ariana? Any other people in his family he might want to say hey to?? And he wants to not be in her shadow…. For real. Ride those coat tails Frankie. What makes me the madest about him is the fact that he used that as an excuse for them to keep him around and that ridiculous statement about giving money to Africa. He may do that and that would be nice. However that should not be used to get votes. Or for that matter trying to use your children for simpathy Derriick. Todd, I watched his sister on 3 shows recently and the last one i was like…is she lip-synching? alining herself to him is not a good idea. I get its her brother, but she is just starting and how many one or two hit wonders have come and gone. She may be on stage with Nicki Minaji, but she is no Nicki. Minaji has worked her way up to a high level and has maintained it for 3 years at least. Two years from now noone will know who Frankie’s sister is but we will remember him. I love your observation about Frankie assuming America voted against the play because we’re, essentially, homophobic. Really? Couldn’t POSSIBLY be because your play stunk, and because we wanted you to know you messed up by not saving Donny. Go ahead and play that card, Frankie. 90% of the fans out here dislike you because you’re a self-centered, immature, shallow, back-stabbing camera hog . NOT because you’re gay. He can’t accept that he failed. He has to have an excuse for everything he fails to do. I’m still loving the fact that Julie said we overwhelmingly voted no….that had to sting! Yeah, I don’t give CBS a lot of credit because I believe they have ulterior motives (like trying to look like they wanted to help Donny stay too), but she didn’t HAVE to say it that way. Makes me kinda wonder how much of a landslide it was. That was such a lame thing to get people to vote for. I mean, even the people who weren’t inclined to actively vote against it, like us, had little to motivate them to go to the computer and vote 20 times. It just wasn’t good! And most of us are O.V.E.R. Team America anyway. They better NOT get any more assignments now that Donny is gone…. I was thinking the same thing Lilly it does seem like they “”CBS”” was trying to get Frankie and Derrick to change their vote to keep Donnie by telling them like that because why that way and why now?!?!?! Smh at CBS!!!! I’m sure CBS watches social media. Opinions from fans about this season, and their support of Donny is EVERYwhere. Unfortunately, CBS is more concerned with APPEARING to care than it is to actually doing what’s right. That’s my opinion, of course. Oh I agree with you. You know they see all of this stuff people right on here. And they act like they don’t care. I think CBS really messed up on this season of BB. This one was really bad. I have never seen such a mess in all my life. Throwing the comps like they did and as bad as they did was really bad and CBS just let it happen. I think Caleb and Christine both should have been evicted immediately from the house after the way they throw the comps. I had to laugh a little evil laugh. Perhaps Julie’s annoyed at his “sucking up.” But, Frankie’s just annoying anyway. Kim, I hate seeing his “conversations” with Julie. When someone is such a phony, anything they say is just meaningless. I just hope somebody sets him “straight” (sorry, I could not resist!) about that. It is definitely not your sexual orientation that makes you so easy to dislike. Haha! Guess we have to get our laughs were we can, Mary…. Can’t wait to see Frankie when they tell him Donnie got asked to be on Bold and Beautiful! his reaction will be priceless!!!!!! OMG, thats right. I forgot about that. His reaction to that will be worth all the pain of this summer. That’s exactly what I thought when Julie told Donny that. That would mean Donny has been on a Network show…and he hasn’t. CBS trumps Youtube. Gotta love the irony in that. Yep, who’s the “Media Mogul” now, Frankie?! LOL, plus he ACTUALLY will have millions watching him! Oh pleeze, pleeeze, pleeeeze tell him and have a close-up on his face when the news is delivered!! So I wasn’t hearing things, it is a double eviction Thursday? Todd you should have mentioned Derrick winning the money and falling as much as he did….I think he did good even though he didn’t get HOH….if I had fallen that much I surely wouldn’t have been able to keep playing. Yeah, apparently he had a shoe issue. They gave them all those shoes to wear, but his were small (he kept saying) and he got bigger ones and he seemed to improve after that. Agree totally Linda! Just FYI, I love the froot loop dingus term too. Sure do miss Zach-attack. I have to re watch last nights episode on CBS later because our show here was interrupted a couple times with breaking news about the pilot that crashed in VA that was from Barnes air base is Westfield MA. They basically confirmed that he died in the crash. I feel terrible for him and his family but that is all that they had for information. Seriously they could have waited another hour and put it on the regular news. They still hadn’t had any real information to offer. So I missed about 2- 5minute segments of the show. I’m sure it wasn’t much but gotta check it out to see what Donny’s family said in their brief segment etc. Ok done my griping for now. Praying Nicole wins Veto (regardless if she is on the block or not) Don’t want a backdoor option…. When Caleb was laying on the couch and Cody was talking with him, I heard them mention something about “slush” in Caleb’s cup (the vessel they used in the HOH comp) … it made me wonder if there was some kind of “fudging” going on in the comp .. like putting that slush stuff in the cup so that it was heavier than water and would fill up the snowman head faster. Guess it would not have to be considered “cheating”, but I thought Caleb acted like he got away with something there. I think he also mentioned Frankie was doing it, but after that they shut the conversation down. Anybody have any thoughts on this? They all did it. They talked about it afterwards. And they talked about how Nicole told Christine to do it. Of course in their minds that means they have an alliance. It’s obvious that Donnys popularity is bothering Frankie. He mentioned it numerous times last night. He’s wondering what Donny has done to make America love him. He should be asking himself (and the others too) what he HASN’T done. He didn’t talk mean about anyone. He didn’t shun people. And he’s not an attention wh*re. Frankie only understands “over the top” not “under the radar”. But i think he needs to start learning how to be “unseen”. Because once he’s out of the house he will have a hard time living down the reaction to his actions. But as we all know…..he’s a spin doctor. And the prescription he’s giving himself is one of pass the buck to America for our unacceptance of his being gay. Maybe HE just needs to accept that using that as an excuse is not acceptable to US. I would never judge him for that. It’s a total non-issue. In essence he’s calling us stupid. If he really wants to know what stupid looks like then he should make sure he watches the show and reads the blogs afterwards. Now there’s documented proof that his “fame” is only in his head. And apparently that’s ALL that is up there. This is great Cat but I have to say, your last sentence made me laugh. You are “The Cat’s Meow” ! This is related to my opinion about the degradation of the BB hgs. I’m sure these hgs think they are MUCH better than the disastrous schlubs of BB15 – because, you now, they are spooning a gay guy all day long and never use racial slurs, right? But they neglect to realize there was so much more wrong with BB15 (and I would argue before that). As we know, too, BB is a mirror on our society. Because we all just accept as normal whatever anyone else does. Think of it as the Jerry Springer effect. Remember the first time you watched that show (and others like it)? It was shocking to the senses. Now, even though you may not approve of the behavior, it’s no longer shocking. These BB16 hgs have some of the horrid traits of the BB15 hgs. The most obvious to me is how very easily they can lie with conviction straight to people’s faces about anything and everything – toss in a hug and “I love you” – and anything is acceptable. Heck, Derrick is so good at it, he thinks the CAMERAS don’t tell us the truth! It should NOT be acceptable. I know some of that is part of winning BB, but it should not be so easy. It should not be so accepted. These hgs should NOT leave the house, learn what others said about them and forgive and forget. Zach’s blase attitude about Frankie and the other hgs in his exit interview was NOT normal. Donny’s hurt feelings WAS normal. With each year as more and more bad behavior of all sorts becomes “normal,” future hgs (and fans) just accept it as “part of BB.” Evidently the ONLY thing that isn’t acceptable is homophobia and racism…. Everything else (even snuggling with a married woman) is fair game. I happen to disagree with that, and Donny reminded me of that this season. But it isn’t going to change. The Jerry Springer mentality has entered the BB house, and it isn’t leaving. Standing up and applauding once again just as I did for Cat’s words!! Standing up and loudly applauding!!! I suspect he’s use to using his sexuality as an excuse for not being liked. In this day and age, that doesn’t wash.
Todd, about Frankie ‘ditto” everything you said. Nominees: If it comes down to Christine or Nicole they will get rid of Nicole because these guys have done nothing courageous so far. Cody: again :ditto” everything you said. I hope Nicole gets lucky and wins veto. If that happens I will watch Live vs 20 min late so i can fast forward when it gets boring. Yeah, except voting out Christine wouldn’t be courageous or bold. They will vote out whichever of the two girls they think is a bigger threat to their game. They are NOT afraid of Christine! If Nicole can play it below the radar this week, and Christine does ANYthing that calls attention to her game or annoys them, it could tip the scale to vote her out instead of Nicole. I would be extremely surprised if a bold move was made. No such thing exists this season. Even when we get down to F4 there will be nothing to cheer about. Unless Nicole manages to win POV and HOH. But how likely is that?? I’ve not been so disappointed in a season (excluding BB15 because it’s a disaster unto itself) since season 6 when the Nerd Herd ran the house. But at least that season had some power shifts unlike this one. Yeah, but you agree that booting Christine this week isn’t really bold, right? I do think the double elimination is bad for Nicole – unless by some miracle she wins a key HoH or Veto – because “the house” won’t even have to scramble to decide who to vote out. The next two people they want out are Christine and Nicole. Then maybe Frankie. The only way the DE gets interesting is if Nicole and/or Christine win HoH or PoV on Thursday. Definitely agree that evicting Christine in NOT a bold move. Not when she has been low man on the totem pole since the BS alliance. completely agree. it will be predictable until the end unless the girls can mix it up. GO NICOLE!!! 1. Christines husband has every right to be upset. 2. Frankies play was NO play but just a string of imitations. 3. They showed them videos from their loved ones because human emotion makes good tv. 4. And the most important one of all: When asked how Donny ranks among the most popular hgs ever to play BB she says “Donny has by far the highest likablility rating we’ve ever had on the show He is awesome. He’s the real deal”..
Oh yes, Mary, I’m a fellow “older” one. Born just over 5 decades ago…. All I’m going to say, young lady…..
Aw, Tessa, I already do! I agree that Christine’s husband has every right to be upset. But he needs to hold Christine accountable for this. She runs to where ever Cody is to be with him. She makes herself available to him at all times. I truly hope that it is Cody that puts her out of the house so she has no doubt about the fact that he was using her. You make US feel great Donny. We love “someone like you”. I’ve been reading interviews with Donny all morning and watching his interview with Jeff. I have to stop! NOW! Because i’ve cried buckets just listening to him. One thing that turned my crying into sobbing was this: With tears in his eyes he says – “I was chosen for this game. And when i walked over that threshold – I won”. Well, now you’ve done it! Out of tissues so have to break into the toilet paper supply! Todd do you have the link for watching Donnie’s exit interview? Thank you! Just hope I have time to go and buy another box of tissues. I think CBS should do a poll of America to decide if TA gets anymore missions. Then tell them we said No. That would send them a huge message loud and clear. Excellent idea. I have a feeling CBS is gaging TA based on its popularity (or lack thereof). As a result, I’d be surprised if they had any more missions – not just because of Donny but because it was LAME and getting more so with each assignment. Lilly and Todd I couldn’t agree more with what your saying and very well said! Personally I feel this was the saddest week in BB history. One Cody has to be the worst floater (yes he is a floater) in the history of the game. He’s been carried by other all the way along and then when he finally gets a chance to make the biggest (putting Frankie up)move in the game. What does he do after winning the veto? Wimps out! As someone said in a previous post he has no balls. He’s may not be going home next week but I’d figure the week after for sure. However hopefully with if being double evection maybe be next week but Frankie (if the HGs are smart but we know they are not) would be the best choice to send home. I truly have no favorites in the house now that Donny is gone and look for to seeing the end of this season on BB. After last nights show (I didn’t think he could do it) Frankie, to me just sunk to the level of maggots on scum. Enough said. One question why when BB16 is on do we always see Frankie with a makeup brush putting who knows what on his face? Oh and Frankie give up on the glitter it’s been done by Gary on BB Canada and done much much better! I won’t repeat what others have said (I don’t watch the live feeds here in Canada they are not free like we get with BB Canada. However that may change next season at BB Canada moves to a different station.) but was a bit surprised to hear Frankie play the “gay card” for people not liking him. I truly felt he had a lot more self confidence then that. Frankie (as Kristen Taekman from the Real Housewives of New York said) “your delusional”! I would like to add they’re have been several gay HG on BBUSA , BBCANADA and BBUK. Fans of the show don’t care if a HG is gay, green, blue or any sort. What they do care about is good fare game play by (no throwing comps and grow a pair) all HGs. Two of the most liked and loved HGs are gay and one even won BB last season. I’m talking about Andy Herren from BB15 (I liked but I know not all did) and Gary Levy from BB Canada season one, who should (was second) have won but didn’t. Ask me about it. Not once during their season did either one of this gay men play the “gay card” and they both did very well in their games. I’m not sure if you all get to watch BB Canada or not but Gary was the glitter Queen and did dress in (for lack of a better word) drag most of the season. I’m gay and don’t dress in drag like many others and don’t understand why guys do but he looked great. Gary is so loved and has a “true” fan base and was even made a guest host once a week last season on BBCANADA. I personally think being gay helps you more in the game. Ok so that is it time to go and watch a movie. I hope I made some sense with what I said. Oh and forgot to thank Cat very well said!!! Of course! Hope all goes well and you feel better soon. God bless you, Jennifer. Cat and Todd are better at keeping you up to date on BB. I just bloviate. But my thoughts and prayers are with you. Prayers going up for you and those who are taking care of you. Hope you will be back with us soon. Very sorry to hear that Jennifer. My thoughts and best wishes are with you.